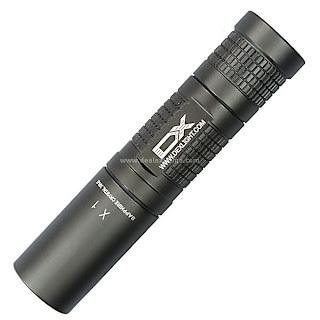 The Dexlight X1 is a multi-mode flashlight using a single AA sized battery to power a Cree XRE LED. The flashlight has two interfaces, a simple mode and an advanced mode. In the simple mode you cycle thru the different modes with a light press of the tailcap clickie the modes are 80% brightness, minimum brightness, then 100% brightness, 50% brightness, strobe and locator beacon. To switch to the advanced mode you have to turn the light off for two seconds from minimum brightness, then turn it off and you are in advanced mode. In advanced mode you cycle thru the different modes with a light press of tha tailcap in the same way as in the regular mode but this time there are many modes to cycle: the first one is maximum brightness, then 15hz strobe then 5%, 10%,20%,30%,40%,50%,60%,70% and 80% brightness, then a 5hz strobe, then two SOS modes one with full brightness and one with minimum, then the locator beacon anc back to 100%. To leave advanced mode you have to turn the light off in one of the strobes for 2 seconds, then turn it on again. Since the first two settings of the advanced mode are 100% brightness and the strobe it can be used as a tactical mode. The regular mode works fine for non tactical users. The light can use either alkaline, lithium, ni-mh or 14500 li-ion batteries, with the 14500 li-ion the X1 is the brightest AA single cell light we have tested even brighter than the Fenix L1DCE. The beam is very white and has a very good balance of throw and flood without artifacts. It is also a good detail that all the modes work with the 14500 battery. The construction is Ha-III aluminium in a gray-brown color, very strong and resistant to impacts and scratches. There are double o-rings to make the light water proof. The lens is a saphire window with AR coating. In the package with the light you get a belt nylon holster, spare o-rings and some spare taicap buttons of different colors, our unit included a black one, orange, red and a GITD yellow one. The locator beacon, not common in many lights emits a short flash every 10 seconds and can be used to locate the light in the dark, it can work for several days in this mode so it is useful to leave it on and find it at night when camping. The Dexlight X1 is a very bright light, using 14500 batteries the brightness is amazing and the multiple modes provide great versatility with runtimes from 30 minutes to 9 hours, an amazing little light that we have liked a lot. You can read more at Dexlight's website or order from DealExtreme for $45. This is a very economic microscope that includes a small led light and can be zoomed from 60x to 100x magnification. To use it you have to insert 1 AAA battery, turn the light on and then point the microscope to the object you want to examine almost touching it with the base of the scope. One of the knobs at the side controls the zoom and the other one the focus. The knobs are cheap but getting a good focus is still easy, magnification is very good and besides having a very small field of view the details are there and while cheap the microscope really works. Among the small minuses the zoom knob is very loose in our unit so when you are in 100x sometimes it just slides down to 60x for this reason and the wider field of view we preferred to use it only in 60x mode. Images are good and the LED is fine to illuminate what you want to see, we could inspect mineral traces in rocks, terrible things in our fingers and played CSI for a while without anything revealing. A fun toy, not a professional microscope but it works and it is very small and pocketable. You can order for $8.63 from DealExtreme.